Dogs are by nature outdoor animals and therefore relish every second spent in the great outdoors. However, in winter temperatures suddenly plummet and inevitably put a damper on the normal way of doing things. While various dog breeds are able to acclimatize and comfortable withstand the frigid temperatures, you can still go the extra mile and provide them with a warmth, comfortable, and dry place to call home when the weather takes a turn for the worst. One such sanctuary is a heated dog house that comes with a long laundry list of benefits for your furry friends. As well as keeping them healthy, a heated dog house provides protection against rain and other elements, helping them to stay toasty and comfortable all winter long. 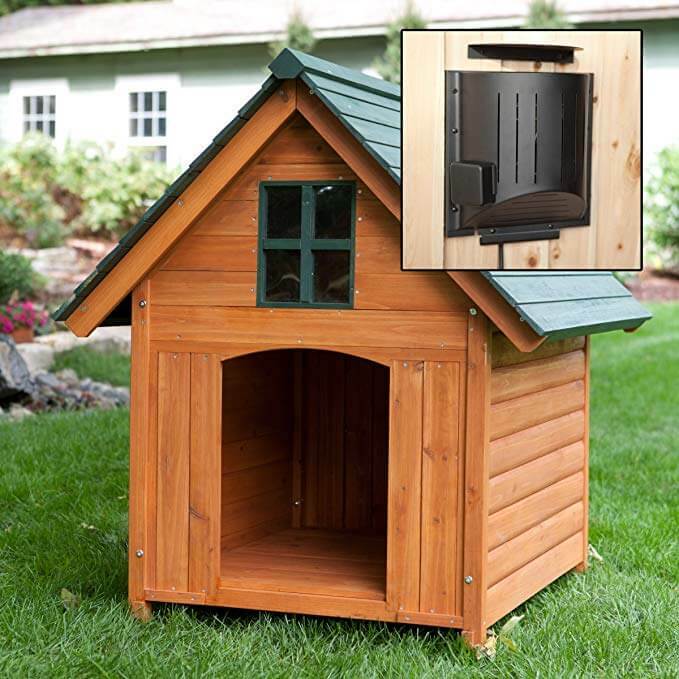 If you’re looking for a heated dog house, you’ll be spoilt for choice because the market is bursting at the seams with models of various types and sizes. The downside is that the ubiquity of heated dog houses can make it difficult to choose a suitable choice seeing as you have to take several factors into consideration including your budget. To help with that, we’ve put together reviews for 10 of the best heated dog houses currently on the market. Coming from an industry doyen with a reputation for making high-end, durable, affordable, and easy-to-use products, the ASL Solutions dog palace is one of the best heated dog houses you can find on the market. If you’re looking for a heated dog house for your furry friend, it should be your first and only consideration considering that it’s a reliable option brimming with a litany of high-end features. Properly installed, the days of your dog putting up with cold nights will be long gone. 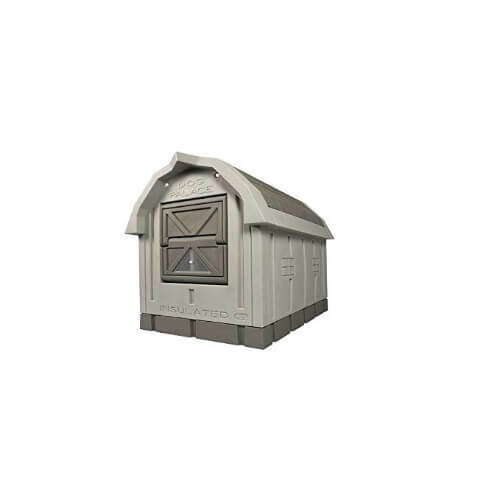 First off, the heated house is a high-quality, durable choice constructed from pro-grade materials, primarily molded plastic. Manufacturers use the same material to make outdoor playground products. As a result, it can withstand several years of use without suffering any significant wear and tear. It’ll be several years before you’ll have to do any repair works or replace the whole house. It features several panels, each of which is filled with a recycled ESP foam meaning that going forward, your dog will enjoy the best insulation from the jaw-shattering cold of the winter. The house relies on a single ordinary 100-watt light bulb that provides more than enough but comfortable heat levels all through the winter. An icon of perfection, ASL Solutions has ingeniously designed the heated dog house so that it maintains a pleasantly comfortable temperature of 700-degrees Fahrenheit when the outside temperatures are hovering around 400-degrees Fahrenheit. Further, thanks to its ingenuity of the design, the heated dog house is capable of raising the temperature by 250-degree Fahrenheit even in the absence of a floor heater, further helping you to cut down on heating costs. An additional feature is the inclusion of an easy pass-through, self-closing, and properly installed and insulated door. The windows are easy to open and close and the slopping design of the floor and the incorporation of a drain assists with the effortless and quick cleaning of the heated dog house, to get rid of any fetid dog smells. Caring for your furry friend warm and cosy doesn’t have to cost you an arm and a leg, as this high-end heated dog house easily shows. It’s a durable option that’ll serve the purpose for several years to come. Like our previous pick, this house is a feature-packed option that delivers on the promise to keep your dog safe, comfortable and feeling cosy through the teeth-gnashing summer cold. If you’re anything like us, you’ll love it the second you set your eyes on it and sold the moment you take a peek inside. It comes with several auxiliary features that point to sublime performance. From the long-lasting polystyrene exterior, the heated floor, the generous insulation of the walls and the ceiling with EPS foam, to the self-closing windows, the heated dog house brings together the best of all worlds. The unpredictability of Mother Nature during winter is all the more reason to consider housing your dog in the DP Hunter Dog House. As well as providing formidable protection against such weather elements as rain, the heated dog house also provides dependable EPS Foam insulation in the walls and ceiling panels. Coupled with the self-closing door and the high-performance floor heater, your dog will indubitably remain comfortable and warm irrespective of the weather conditions prevailing outside. Aside from being water-resistant, the heated dog house also has a 30-watt floor heater to ensure your dog remains warm and toasty all winter long. The durable construction is yet another reason to go with it. The brand offers a generous lifetime warranty with each purchase to cover against cracking and breaking. For the convenience of your dog, it sports a lower door panel with a see-through window to help the dog comfortably monitor the going-on outside. Because the window panels are self-storing, they'll remain closed during winter and open to allow cross ventilation on hotter months. Considering that the heated dog house is elevated some 4 inches from the ground, the likelihood of water sipping in and ruining your dog’s warm, comfortable bed. 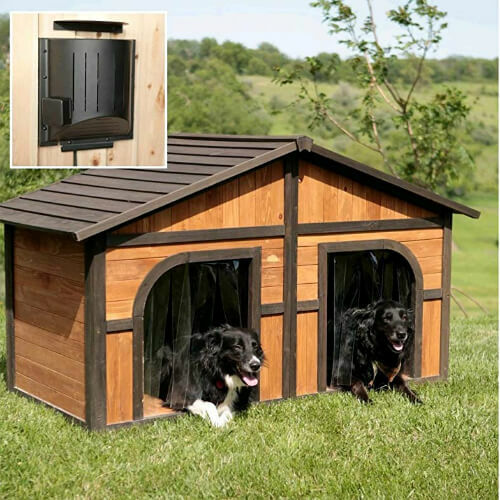 And for hassle-free cleaning, the heated dog house has a hole for draining and a slight slope. 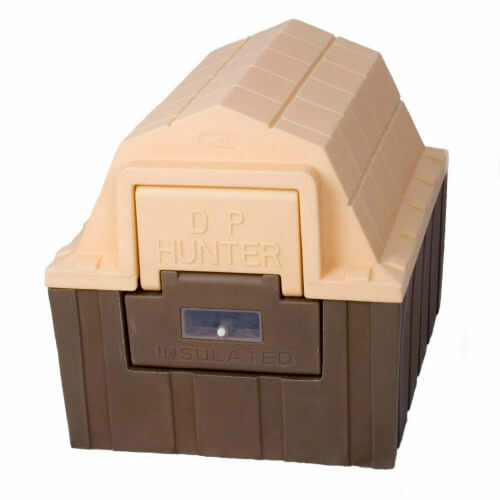 In all, the DP Hunter Dog House is designed to provide your dog with a comfortable, warm and a clean environment. The powerful floor heater, water resistance, ease of cleaning and durability it provides are hard to beat. If you’re looking for a house with lots of space for your large dogs, look further than this option. Unlike other models, this model is markedly high on all the exceptional features and specs that easily set it apart. Two of the most notable features are affordability and practicality, making it a solid choice for those working on a budget but don’t want to compromise on quality. If that describes you, then pay attention. Considering that it comes with a removable partition and double doors, it is a perfect choice for homeowners with one extra-large dog, two large pups, or several smaller dogs. With a width, length, and height of 60 by 30 by 40 inches, respectively, one extra-large dog will have plenty of space to roam, turn, crawl, or just stand as the winter cold rages on. Coupled with the ease of removing the middle partition for accommodating one or two more large dogs, the house will surely satiate your dog’s need for warm, cosy space. The most essential feature, the Hound heater works exactly as advertised, providing your dogs with lots of warm so that his or her palace is invariably comfortable and liveable. Like one of the options reviewed earlier, the Hound heater is protected by a grounded cord that among other things, is durable and features a super-protective heavy-duty chew-proof 8-foot cord. The sheer length of the cord means that you won't struggle to reach the nearest power outlet while the included cord strain relief prevents any possible tension problems. Other features that will tickle your fancy include the ease of installation and the durable solid wood construction that helps keep out weather-related elements. As for effortless cleaning, you can easily and quickly remove the room and the floor panels. Keeping your dog warm, dry and comfortable is a task this house easily excels at. Those in search of the best protection and insulation for their dogs, here is a worthy contender. 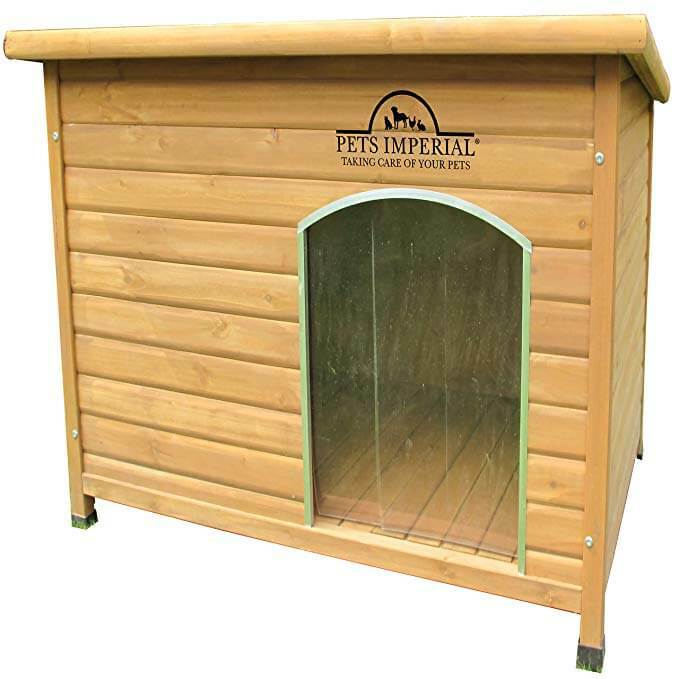 If you’re looking for an option for a small dog or puppy, this Dog Palace Breeze would make for an exceptional choice. It seamlessly continues ASL Solutions’ tradition of fastidious construction, professional craftsmanship, unyielding reliability, and dependable performance. Plus, when similar models are going for an arm and a leg, this model stands out for its affordability. You don’t have to sell one of your kidneys to provide your beloved dog with a comfortable, warm, and dry palace to call home. With proper care and maintenance, this house will offer your dog several years of faithful and reliable service, which makes it a must-have. Simple yet high-end, the Dog Palace Breeze is very effective at its job – keeping your dog safe from the devastating winter cold and the sweltering heat of the summer, which makes it an all-around workhorse. Compared to other models that rely on electricity, this option is solar powered and has a conveniently long 8-foot long cord that enables you to locate the solar at an optimal position to ensure the best performance all through the day and night. The product comes with a solar powered exhaust fan that generates an indirect breeze all through the day, ensuring the dog is cool when it isn't sunny outside. With a height, width, and height of 6.5 inches, 7 inches, and 5.75 inches respectively, the heated dog house takes up minimal space and installs in a snap. The hardy, fastidious construction quality makes it resistant to diverse weather-related elements and is easy to clean. The bottom line is that the Dog Palace Breeze, despite being a pocket-friendly choice, has all the instrumental features and specs to ensure your dog stays warm and comfortable year in, year out. You’ll never look back or regret your choice ever. There are several options on the market but few compared to the efficiency, build quality, and durability of the Pets Imperial® kennel. The house is sublime in every way imaginable right from its classic, contemporary look and its prowess at keeping your dog comfortable, warm, and feeling cosy all through the winter and summer. Besides easy assembly that doesn't require the use of any tools, it's also a perfect choice for various dog sizes and with a pocket-friendly price tag, it won't leave a hole in your pocket like some expensive models would. Continue reading for an in-depth review of the heated dog house. A pariah in this industry, it pulls no punches in ensuring your dog has superior protection from the cold of the summer. The first step towards achieving this is the insulation of all the panels, a process that includes 0.47 inches of timber, 0.51 inches of Styrofoam, and another 0.08 inches of plywood board. These insulations are more than adept at keeping cold and extreme temperatures at bay, so that your dog remains comfortable, warm, and toasty this season and all the other coming seasons. The performance of the heated dog house is further aided by the fact that compared to cheap, off-brand models, its walls are 150 percent thicker. Another proof of the product’s high-end construction is the use of commercial-grade, animal-friendly timber that’s designed to last more than a lifetime. Boasting a 2-inch ground clearance, the design allows for free and efficient air circulation ensuring that the floor is always dry and comfortable. And in light of the adjustability of the dog houses’ rot-free plastic cup feet, it’ll sit stably on both smooth and rough terrains. To these add the easy-to-clean removable floor, inclusion of two locking arms, and an easy-to-open roof. With a broad array of features to keep your furry friend warm and comfortable all winter long, the kennel is a worthy consideration for purchase. Unlike the vast majority of options, this one comes with plenty of space for those with two average sized dogs or one large dog. While it’s a little expensive, it offers great value for the money and would be an ideal choice for the value-conscious user in search of a heavy-duty house capable of comfortably accommodating some pretty heavy dogs. And of course, it's heated. Going forward, you won't be tormented by the thought of leaving your dog out there shivering in the winter cold as you spend the night comfortably tucked beneath warm covers. As mentioned earlier, it is pretty spacious with external dimensions of 51 inches by 43 inches by 43 inches. As a result, it provides plenty of space that can easily accommodate the one super-large dog or two large dogs. The unique thing with this product is the incorporation of a removable partition right down the middle that provides for easy sectioning off the interior to accommodate the said two dogs or a single large space for your extra-large dog. Evidently, it has two large doors. To the features mentioned above add the fact incorporation of a high-performance and reliable internal heater that reliably provides a safe and cosy warmth to help your dog through the coldest months of the winter. The deluxe heater is removable and installs with lots of ease any pet house wall. The heating device is animal-friendly and comes with a spring-protected cord that's also chew-proof and long-lasting. Running on 150-watts of electricity, the heater is energy-efficient and helps you save on operational costs. The asphalt-covered roof is also easy to remove so that cleaning is a breeze and to prevent rain from slipping into the house and ruining your dog’s comfortable, warm stay. If you have one extra-large or two large dogs you’re looking to shelter, considering going with the Heated Fir Wood Duplex Dog House. Besides being a heated option, it’s also durable, easy to clean, and offers great value to the user. Caring for your pets go beyond frequent trips to the vet and similarly encompasses getting your furry friends a comfortable, warm, and conducive heated house. 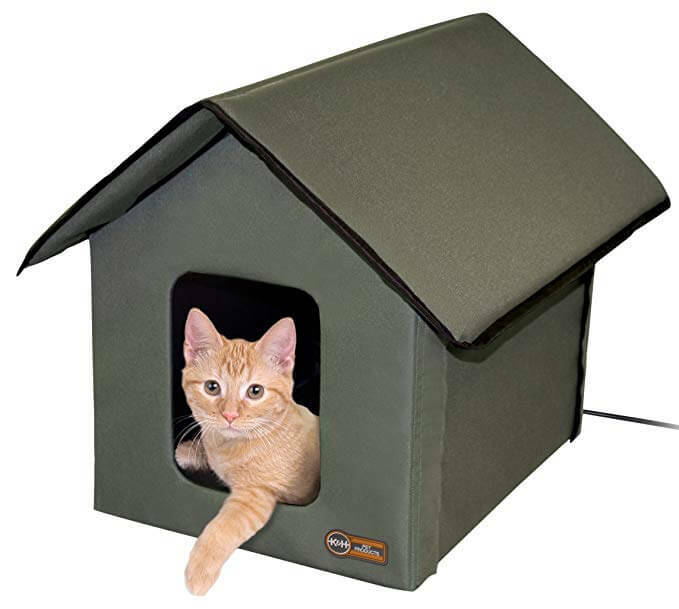 One of the best on the market currently is the K&H Pet Products Outdoor Kitty House. The productive is professionally and innovatively designed so that it makes the lives of your dog or cats a lot better and far more comfortable than it already is. Among other things, the heated dog house is durable, heated, has a number of safety features, and two protected exists. In addition to kitties, the unit is a perfect choice for small puppies considering that it has plenty of space within. The main feature is without a doubt the heated bed. Rather than spend the rest of the winter in the cold, your furry friends will relish the warmth and comfort that comes with sleeping in a heated environment. Being compact and lightweight means it is easy to set up in whatever spot you want and it won’t take up as much space as other models on the market. You can decide to set it up in the barn, the garage, shed, or the porch. Another feature that will immediately win you over is the robust construction. The no-frills zip-together design and the sturdy exterior means it can withstand extreme use while keeping the dog or cat warm and comfortable even with the prevailing low winter temperatures. Further, the unit is waterproof, thanks to the brand’s prudent use of heavy-duty, long-lasting 600 denier nylon with a vinyl backing. The Lectro-Soft Outdoor Heated Bed poses no danger to the animal even when it’s operating at optimal temperatures. Cleaning it is a breeze and so is the process of installation that doesn’t require the use of any special tools. In all, the innovative design goes a long way in making the life of your furry friend easy, comfortable, and much better. It’s worth every penny you’ll be paying for it. The Wooden Barn Dog House is the definitive go-to heated option for the homeowners who want to go the extra mile to ensure their dogs are safe and secure from the winter cold. Like the vast majority of options featuring on this list, the product comes with its fair share of positive attributes that deservingly earn it a spot on this list. Some of these include the fact that it’s heated, has a raised floor, features a long-lasting solid fir wood construction, and provides formidable protection from various adverse weather elements, including and especially rain and cold. The inclusion of a high-quality, durable, reliable, and energy-efficient heater means your dog will always have a cosy, accommodative, warm, and comfortable palace to retreat back to at the end of the day. The best part about the heater is the fact that it’s thermostatically controlled meaning that it only runs when the temperatures dip below a pre-set value, making it an economical choice. Further, it clearly demonstrates its mettle by being able to raise the temperature of a well-insulated dog house up to 32 cubic feet in size, putting its performance with other industry stalwarts. 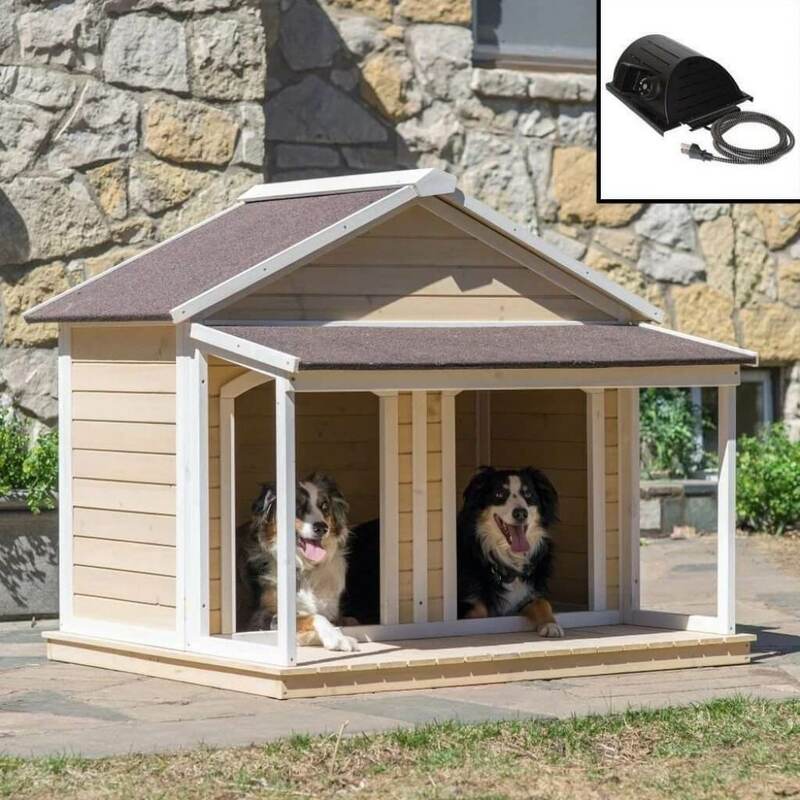 Additional features that’ll tickle your fancy include the fact that the heated dog house has heat shields for protecting your furry friends from excess heats and that the cord is protected by a heavy-duty spring that's also animal-friendly. With its durable and easy-to-install 150-watt heater, it also features one of the best construction qualities in the industry. The use of commercial-grade fir wood means it is capable of taking a beating before its structural integrity starts to give. Other additional features include a raised panel floor and an easy-to-remove roof that makes cleaning quick and a cinch. The dependability, affordability, and ease of using it are immensely appealing. The attractive cedar stain finish, extended covered porch, and the internal heater are hard to overlook. Following closely on the footsteps of our previous pick is this top-notch option. Being a pro-grade choice, its performance is far from the middle-of-the-road performance you’d expect from cheap, off-brand models on the market. It ticks all the right boxes and firmly puts the hammer down to separate itself from other models out there. 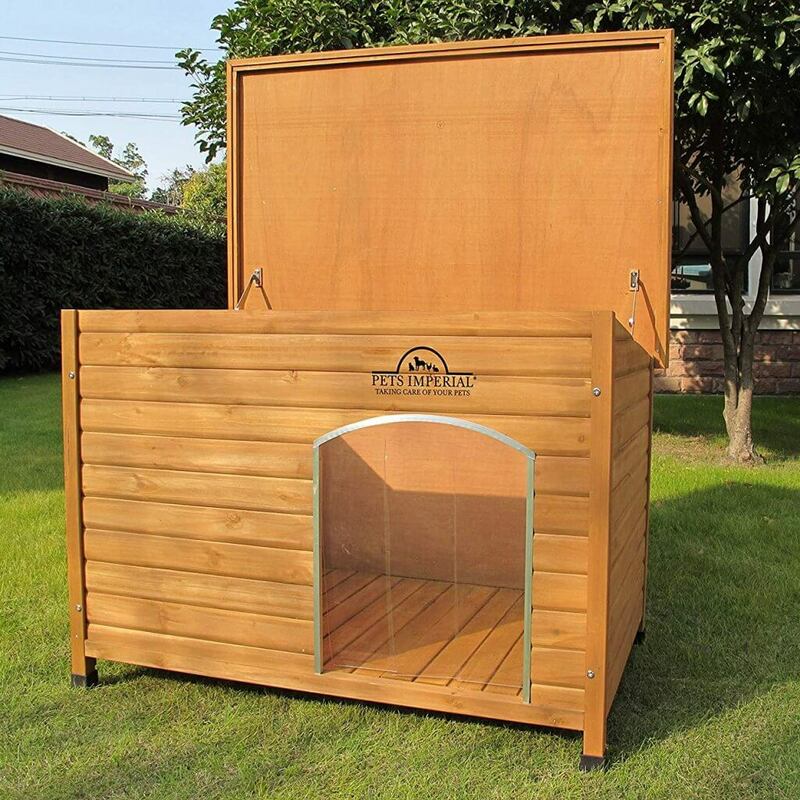 Aside from the fact that it has a durable, thermostatically-controlled heater, the heated dog house also features a solid fir construction, weather-resistant roof and legs, and a high-end, wire-wrapped, chew-proof cord. An in-depth review follows next. The hardy, fastidious construction of the unit using industrial-grade fir wood puts its durability at par with other high-end, costly models out there. It can stand extreme use for years on end and still provide exceptional performance even when it starts approaching the tail end of its useful life. To keep your furry friend comfortable and secure, it comes with a raised slat-wood floor so it’s not flooded with water when it rains. It’s also aesthetically pleasing and will effortlessly compliment your backyard. Because the brand has a reputation for pulling all the stops to provide high-performance products, it’s not at all surprising that the dog house perfectly and seamlessly blends design, affordability, and performance. It comes with a long-lasting 150-watt thermostatically controlled heater with an impressive coverage of up to 32 square feet. It assembles in a snap to provide your pet with a comfortable, warm, and cosy place to call home. Besides, it has a modern, wire-wrapped, animal-friendly, durable and chew-proof grounded cord. With its laundry list of instrumental features, its performance is nothing but hunky dory. It meets and even exceeds performance expectations, which is surprising considering that it costs less than 400 bucks. 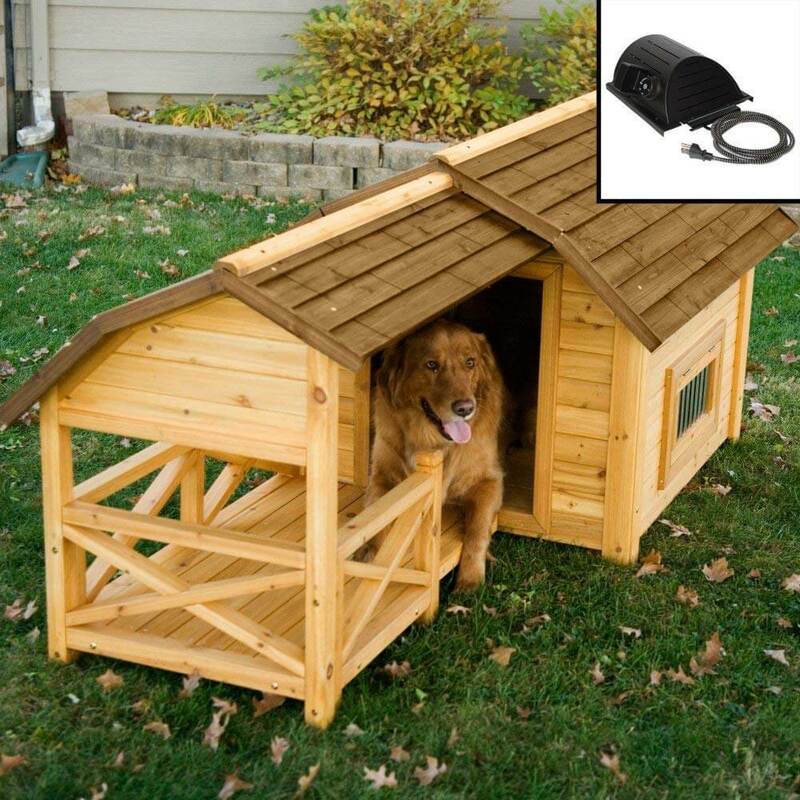 Rounding up our top 10 heated dog house picks is this solid and durable Large Heated Outdoor Wood Dog House. Despite coming tenth on the list, it easily holds a candle to other high-end and costlier models on and off this list. It works on the same keel as its competitors and even outshines some of them considering its durable wood construction, slant-roof design, easy installation, and off-centre entrance. The icing on the cake though is the automatic temperature controlled heater that ensures your dog remains warm, dry, and comfortable through all seasons. With several competitive advantages over its main competitors, it’s easy to see why the dog house is an all-time favorite of value-conscious homeowners the world over. 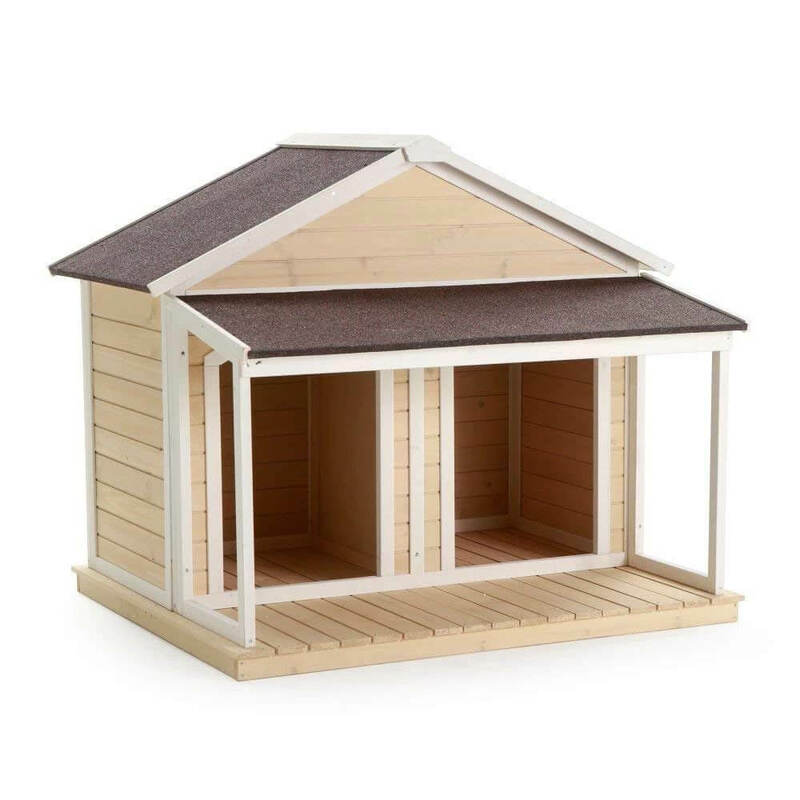 The use of industrial-grade wood for construction and the slant-roof design guarantees that your furry friend will always be safe from adverse weather elements. Rather than self-closing window panels, the heated dog house incorporates an automatic temperature controlled heater which spares you the hassle of closing or opening the houses' windows in accordance with the prevailing weather conditions. With an automatic temperature controlled heater, it will invariably be comfortable and your dog cosy and toasty all day long. Boasting a lifespan of averagely 50,000 hours, the heavy-duty, high-performance heater that provides up to 150 watts of heating power. The brand, keeping in mind dogs' penchant for chewing things other than shoes, uses a high-quality, super-protective and chew-proof cord. As a result, the likelihood of the dog spending the night in the cold after inadvertently chewing the power cord is remote at best. Plus, the heated dog house features an off-centre entrance for superior protection from the weather and to enable the furry friend turn around with lots of ease. The streamlined and simple design makes installation both quick and a breeze. You don’t need any special tools or skills. Together with the other slew of attributes, it offers great value for your money. An essential consideration for homeowners in search of a heated dog house is the amount of space it comes with. It should be spacious enough to comfortably accommodate your furry friend for some years if they’re still growing. The space should be enough so that standing at full height, sitting at full length, turning, and laying down is not hindered by space constraints. If the dog house is partitioned it accommodates more than one dog, all the occupants should be able to stand, sit, turn, and lay down snugly without encroaching on others’ space. Keep in mind though that if the heated dog house is considerably big, it’ll take time and energy for the heat to evenly dissipate throughout the house, which will indubitably translate to high operational costs. As a rule of thumb, there is a strong correlation between the price of a heated dog house and its quality. The price is a reflection of the level of expertise that went into the construction of the unit, its durability, ease of use, and the value it will provide over its useful life. As a result, consider your budget before making a choice. High-end models come with several nifty features compared to their bare bone, entry-level counterparts. Not all products observe this rule though; you’ll likely to come across a cheap, humdrum heated dog house that will outlast and even outperform some top-notch models. This refers to the ability of the heated dog house to provide your dog with enough heat to thwart the frigid temperatures of the winter. The heater needs to be high-quality, durable, and powerful enough to provide several years of efficient, dependable, and trouble-free heating to your dog. Patently, the performance of a specific model will vary depending on the climatic conditions of your location. Also, make a point of being conversant with your dog’s breed and heat requirement to enable you to make a more informed and suitable choice. Heated dog houses that come with natural insulation on top of the heating element provide the best performance all year long. The last salient point to consider before making a purchase is the quality of construction. It should be crafted from high-quality materials to enable it to withstand loads of abuse and wear and tear before it gives. The floor should not allow the entry of water when it rains and it should provide enough ventilation so your furry friend doesn’t suffocate should it get too frigid. Proper insulation is enough for keeping out drafts, wind, and rain. Q: How difficult/easy is it to assembly one? A: Installation is a simple and straightforward DIY project. Brands streamline the process as much as possible to take the hard work out of it. Armed with a screwdriver, it shouldn’t more than an hour to set it up. Q: Isn’t electrocution a possibility in a heated dog house? A: For most high-end models, no. Manufacturers go the extra mile by using heavy-duty wire-wrapped, animal-friendly, chew-proof cords to eliminate that possibility. Irrespective of your dog’s heat requirements, our list features some of the best heated dog houses on the market that are guaranteed to keep them warm, toasty, and comfortable all winter long. Plus, the vast majority of them are cost-effective, easy to clean and install and are built to last more than a lifetime. You can therefore confidently choose safe in the knowledge that irrespective of your selection, you’ll get the best bang for your buck.